Wine lovers usually have a preference of either white or red. If you have made a resolution to count your calories and improve your health, you may be wondering which wine offers the most health benefits. Although red wine has been praised for its heart healthy benefits, white wine is not without its beneficial aspects as well. White wines are mostly made of white grapes; they are made without skins or seeds. The skins are separated from the juice and yeast is added for fermentation. White wines have a light, crisp, fruity flavor and aroma. Red wine is made from the darker red and black grapes. The crushed grapes (with their skins) are fermented for one to two weeks. Red wines have a richer flavor. According to AmoLife.com, tannins (naturally occurring compounds found in the skin of grapes) are the main difference between red and white wines. Tannins contribute to the color and flavor of reds, making them drier and contributing more body to the flavor. 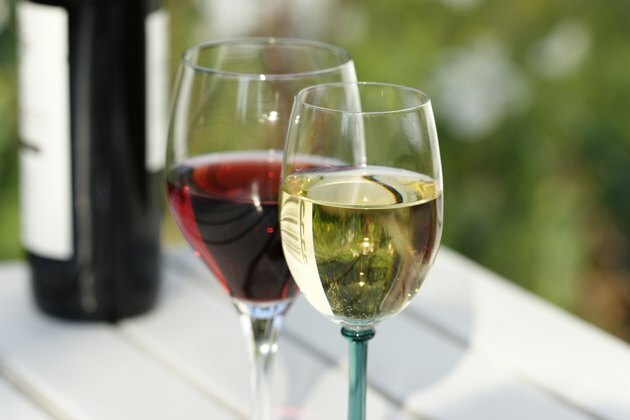 Consuming alcohol -- including wine -- in moderation reduces your risk of coronary artery disease by 30 percent, according to the Linus Pauling Institute, making red or white wines beneficial additions to your diet. Red wine is a plentiful source of powerful antioxidants, which may help prevent heart disease by raising good cholesterol levels and protecting the arteries from damage. Resveratrol -- a powerful antioxidant found in grapes -- may be the key ingredient in red wine. While the effects of resveratrol in humans requires further investigation, it might prevent cancer cell growth, including the growth of breast cancer cells, explains the Linus Pauling Institute. It might also offer cardiovascular benefits that protect your from atherosclerosis -- a condition characterized by fatty deposits in artery walls. Since grapes for red wines are fermented longer (and with the skins), red wine contains more resveratrol. WineIntro.com lists the caloric content for wine, according to the United States Department of Agriculture, as 74 calories for a 3 to 5 ounce glass of red wine, 70 calories for the same size glass of white wine and 73 calories for a 3 to 5 ounce glass of rose wine. White wines usually contain slightly fewer calories than red wines, but this can vary in both reds and whites. Whether you choose to drink red wine or white is a matter of preference. Although there may be benefits to drinking wine, you should do so in moderation. The risks of drinking too much of any alcoholic beverage can easily outweigh the good. Moderation is defined as up to two drinks per day for men and up to one drink for women, according to the Harvard School of Public Health.